You’ve been warned. Should you wish to maintain the sanctity of your internal imagery of Jane Austen, turn back now, before you step into the not-so-forgiving light of real history. Do thoughts of frocks and frolicking and tea cakes and rainbows seen through the thin gauze of parasols really blow your skirt up? Wishing you could be amongst the ladies and gents of an Austen ball? Hoping against hope that somehow, magically, you could be transported into Jane’s idyllic agrarian life? Jane Austen’s England, in all its cool clarity and detail, is probably not where you should look for inspiration, and may in fact leave you reeling; your perfect imaginary life forever ruined! The humanity of it! Able-bodied men were constantly worried about being forced to join the Royal Navy. Many thousands were dragged out of their lodgings and off the streets, fitted for a uniform, and directed toward the nearest ship despite having foreign citizenship and the passports to prove it. A rude way to wake up indeed, and ruder still if you found yourself fighting against your own country. Score one for England! Jane Austen’s visits to her brother’s fashionable London apartment took place only blocks away from unspeakable squalor. Traveling there, she would have undoubtedly passed at least a few decomposing corpses strung up alongside the road as a warning to criminals. Seeing as how death was the penalty for almost every crime, even trivial ones, sights such as these were commonplace but probably still fairly distracting. In an effort to free the local parish from the unwanted costs of raising illegitimate children, the pregnant woman was compelled, under the Bastardy Act (giggles!) of 1733, to name the father of her child, who then had the choice to either pay the church for the upkeep of the kid or to go to jail. Barring the ability or desire to do one of those things, he could choose to marry the lady, or run away. A perfect beginning to a perfect marriage, it would seem. Extremely desirable, right? Candles smelled like the slaughterhouse, income gaps between rich and poor were ridiculous, and medical staff were almost hysterical in their ineptitude. But, all of this is ignored in Jane’s masterpieces, swept under the rug along with the burned remains of last year’s dress that, oops, accidentally set on fire (small price to pay for sitting in the part of the room with a temperature above 30 degrees, because seriously, that corner over there is literally frozen). Austen’s works were created by a lovely lady who, despite her apparent grace, must’ve been stinky beyond all comprehension. And even though it hurts to say it, she probably, just like the rest of her monied comrades, possessed an excessive amount of free time and thus, led an epically idle lifestyle. I suppose it’s no great astonishment that she chose to leave that kind of information out. Oh, it stings, but it stings so good. While this beautiful, impeccably-researched volume will rob you of your fancies, it leaves in their place a much more interesting and dynamic picture of Austen’s life and times. Never will you have more appreciation for Jane until you fully understand the world she occupied while spinning peaceful, blissful tales of country life, tales that always, somehow, end just the way they’re supposed to despite being outlined on a napkin in the back of a filthy carriage, squelching through 3 inches of mud. Jane Austen’s England is the first book to address the daily lives of Austen’s contemporaries, stocked full of interesting facts and firsthand accounts (those of governess Nelly Weeton are particularly intriguing). The considerable skills of Mr. and Mrs. Adkins have never been put to better use, something which will become obvious after you stroll brightly from cradle to grave through marriage, child-rearing, fashions and filth, sermons and superstitions, and wealth and work. You’ll be clinging to your wool socks and smartphone like never before. Also, inquisitive researchers and flippant dabblers alike will find lots of goodies lingering in the back pages: a chronological overview, chapter-by-chapter notes, a full index, and a dazzling bibliography all await. So pull up your petticoats and start trudging through the mess, because the real world is truly an amazing place, even more amazing that Jane Austen was a part of it all. 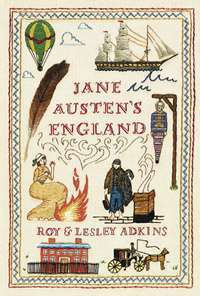 Jane Austen’s England will leave you dumbfounded! And for those of you who fear the lamentable loss of your Regency idealism, don’t worry, there’s always Colin Firth. Thanks for this great review. I have recently finished this book as well and found it impossible to put down. In fact, I read it so fast that I fear must go back and read it again. Did it REALLY say that a climbing boy got stuck in a badly designed chimney and died at a house Henry Austen would move into a few years later, at 23 Hans Place? Or did my overheated imagination conjure that up? Also, the creepy cross-stitch cover is a delight. Oh yes, wasn’t that story of the climbing chimney boy just, well, completely bone-chilling? Stunning! I’m glad to hear you enjoyed the book and the review! Fascinating review of what looks like a riveting read. Thanks for putting us all on to this. Great review. I have yet to read this, but I went to a talk given by the authors a few months back at The Museum of Somerset about the book and it seemed really interesting. I will have to pick it up soon. Ooooh sounds simply horrid. But I am not afraid. I’ll add it to my collection- thanks! Excellent review Shelley. I am reading Longbourn right now which is a parallel downstairs story of Pride and Prejudice told from the view point of a servant. It is a similar vein in that we see the gritty side of the Georgian era. It took me a while to adjust to the rawness of it all, but it grew on me. I think this book would have a similar impact and I look forward to reading it. I am so glad you enjoyed it so much. I think that Regency-era authors and historians will appreciate it too. I picked up a copy of this as soon as I found out it existed. Haven’t managed to start reading it yet, but this whets my appetite! May have to start it as soon as I finish what I’m currently reading. It sounds wonderful! Roy and Lesley Adkins have directly inspired my work-in-progress, The Lost Letters of Lizzie Austen. I’ve read several of their other books, including the companion book to Jane Austen’s England, “Jack Tar.” I enjoyed your review and found it spot on! LA, my story isn’t about Elizabeth Bennet. The Lost Letters of Lizzie Austen (working title) is based on Jane Austen’s fictional sister, who also happens to be named Elizabeth, a very common name — a name I chose deliberately, for contrast and irony. But I thought I would spell it with an “ie” rather than a “y” to set apart the two. My fictional Lizzie Austen, through a cruel twist of fate, was quite forgotten by the Austen family and raised by the Littleworths. Her world iwas more like the world described by the Adkins in Jane Austen’s England, and Jack Tar. I’m having great fun writing it, and I’ll contact you when I am close to publication. Thanks for your interest, and for your extremely informative and entertaining website and blog! Must she? I thought standard Regency practice for even a moderately well-to-do lady was to bathe once a week and change one’s linens with regularity (as Brummell said: ‘lots of linens, country washing’). If she also lived a sedate life with little exercise or exertion, why must she necessarily be putrid? From my understanding bathing once a week was not the norm in the Georgian and Regency-era. It was a lot of work to heat and haul water even for a sponge bath. Beau Brummell was a dandy. Yes, he mentions lots of linens. He could go through 20 cravats while dressing before he tied the one he liked. He was also a frequent customer at Floris in London where he purchased scents to mask the smells. Jane Austen did not live a sedate life. She contributed to the household chores, walked many a country lane and entertained her nieces and nephews. Ladies inner muslin shifts were washed regularly, but their dresses were not. This is an era of no deodorant and infrequent washing. Saying she was putrid is harsh, but by today’s standards, she probably was. Now back to the fantasy world Austen created where no hero smells of sweat, horse and brandy and the heroines are as fresh as a daisy. That’s how I like to think of it anyway. If you could point me to some firsthand source material for their washing habits that would be lovely, I’ve still so much to learn about their era. :) I’d thought that the reasonably well-off households bathed once a week but shared the bath-water (to save on all the awful drudgery you alluded to). Not ideal for the last one in, but better than nothing. But didn’t each member of the household also have a wash stand with fresh water and soap each morning to wash whatever bits necessary? I suppose some would only wash their faces in it, yet others might have a more comprehensive wash; and if it were done with soap and followed with clean linen I think they’d be fine.